The cheesy sax, the glamorous assistant, the whooping and hollering: Playtech have certainly gone to town in the opening sequence to their game show-themed slot, Time for a Deal. Based on classic TV quiz shows, Time for a Deal looks at first glance like the great Playstation game, Buzz, with its abundance of neon colors, solid-jawed presenters...and whooping and hollering. 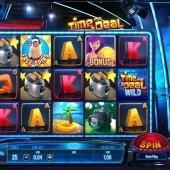 A 25-payline slot online played out over five reels, the slot is packed with interesting bonus features and offers slots fans a shot at hitting the progressive jackpot. On the reels you will find colorful Jack-to-Ace symbols (which animate wildly whenever forming a winning combo) plus various prizes you may find in a TV game show, ranging from the rubbish (a toaster) to the decent (a camera, holiday, and diamond ring) and the very nice indeed (a car). The Time For a Deal logo is Wild and substitutes for all symbols other than the Scatters. The Big Deal Bonus is activated when you hit three Bonus Scatters on Reels 1, 3 and 5 (look out for the beautiful assistant clutching an over-sized gold coin). Our host Roger presents three mystery doors - cunningly numbered 1, 2 and 3 - from which you pick one. Reveal a gold coin and you get to spin five reels of the Big Deal Slot Machine; reveal a silver coin and you will spin just the three reels. The Big Deal Slot Machine is essentially five reels of multipliers - line up as many multipliers as you can to win mega cash prizes. However, land three gold coins during the special bonus and you will bag the progressive jackpot. There's 25 Free Spins Also up for Grabs! Free spins junkies aren't left behind, however. Land three Roger the presenter Scatters on Reels 2, 4 and 5, and you will activate a free spins round with up to 25 spins available for some top-quality grabbage. There are three mystery lines to pick multipliers, additional Wilds and number of spins from first. Once set you will then play out your freebies. If that seems like a lot of bonus material to cram into one online slot, there's one last treat during the base game. At random during normal play Roger will award a guaranteed win or cash prize (your choice). It's a nice little added extra if you can't quite trigger those bonus features. 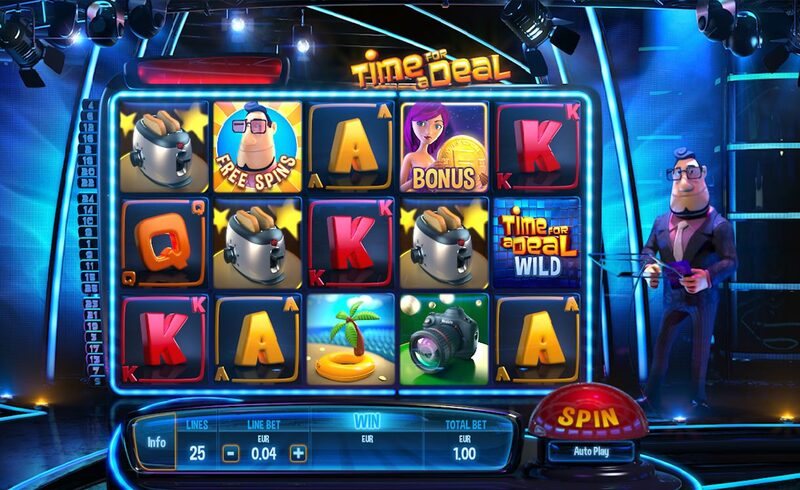 Time for a Deal is a great advertisement for online slots in 2014: it's fast, frantic, packed with extra features, and lovely to play. Prior to playing this game, perhaps only Ash Gaming's TV show-themed Britain's Got Talent slot and the Deal or No Deal slot from Gamesys really cut the mustard. Those need to move over now; there's a new king of game shows in town.